Enter the text to be customized here. Please use the sample image as a guideline. Include: Guest of honor's name, party date, time, location, RSVP info etc. Proofing time is 2 business days from your order date. 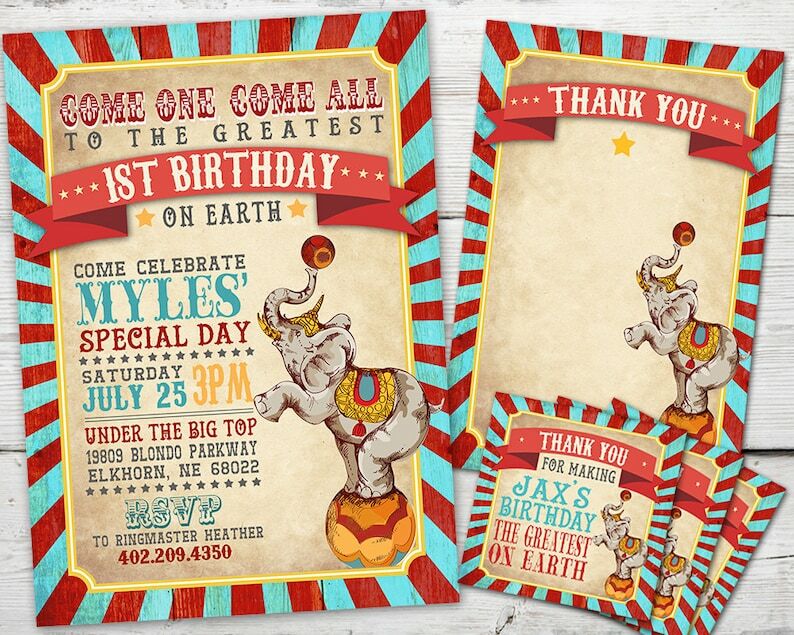 This Vintage Circus Birthday Invitation has a fun, cheery, vintage feel in reds and teal blues and features a happy Vintage Circus Elephant who's ready to party! Your party guests will LOVE this PRINTABLE Circus Birthday Invitation. Start your Vintage Circus party off in style with this unique Circus Party Invitation. Print as many as you would like for one low price! Matching printable Circus Thank You card, Circus Favor Tag, Circus Pendant Banner and Circus Party Sign also available. Just make your selection from the pull-down menu. This is a 5 x 7" PRINT YOURSELF Invitation LIsting. DIGITAL FILE ONLY. Save loads of time and have your invitations and thank you cards printed and delivered to your door. Skip the time-consuming process of finding a printer and get to the rest of your party planning! I'm happy to provide a quote for printed invites and insert cards. Please send me an Etsy conversation message with quantity needed and I will return a quote for printed invitations with envelopes. I do have a minimum of 10 printed invitations and they come in quantities of 10.. ie. 10, 20, 30 etc. Other matching party items are sold as printable files only. Wording can be changed to whatever you'd like it to say. Please send all text in the "note from buyer" section during checkout. If color changes are needed, please include your request in the "note from buyer" section also. Customization is my specialty! Proofs are sent 2 business days from the date of your order (not to include weekends). The proof will be sent via an Etsy convo and all communications will be sent via Etsy. Final Digital File will be sent to the e-mail address on the order form. You can print the invitations from home, your local print lab, i.e. CVS, Kinkos, Staples, Office Depot, Wal-mart, Target and Walgreens or online at Snapfish, Vista Print, etc. If you would like me to professionally print them, I can do that too! Please send me an Etsy conversation message with quantity needed and I will return a quote. They are printed in quantities of 10 ie. 10, 20, 30, etc. PLEASE NOTE: This file is for your personal use only. You may not forward, share, sell or distribute the file. Please send an Etsy conversation message if you have any questions. Thanks for stopping by! No refunds on printable digital items and customized orders. Due to the nature of a digital proof, no refunds will be given once a proof is sent via Etsy message or Email. For printed materials, once you approve your proof, your cards will be printed exactly as the approved proof. If there is a problem with your printed cards due to printer error, your cards will be reprinted correctly and reshipped ASAP. There are no refunds on printed materials. For all printed items, I ship to the U.S. and Canada primarily. Shipping quotes can be given for countries outside the U.S. and Canada and will vary due to size of printed order. Please note that Etsy requires a shipping address for every order, even if it's for a digital printable item. Please read items carefully and beware that item colors on DIY printables and digital files may appear slightly different than viewed on your screen due to color variances on various home desktop printers and computer screens. TOU: All designs are the sole ownership of partymonkey and mygoodgreetings.com, only to be used for private usage and not for commercial resale. Can the invitation be customized for two kids or for another event or do I have to stick with the sample image format? I am happy to customize the text as needed on the invitation or announcement. Text customization is my specialty and I can always make adjustments within the design to accommodate your text. Can the colors be changed to match my party color scheme? Overall, Yes! I am happy to customize the text colors and most of the graphics to match your color scheme. There may be an exception with some of the more detailed, watercolor type of graphics, but overall yes, I can match your theme. If you have additional questions about changing colors, just send me a message. My proofing time is 2 business days (M-F, holidays excluded) from the date of your order. If you need to rush your order, there is a rush option available. Please ask and I will point you to my rush listing. Can I have the invitation in a different size than 5x7"? Yes, I am happy to resize the final digital file(s) to your specific needed size. There is a $5.00 charge to resize the file as some graphics may needed adjustments so they do not look distorted. lf you need a different size than is described in the listing, please ask and I will point you to my resizing listing. Can you print the invitations for me? Yes, my printed invitations are professionally printed and come in quantities of 10. Please let me know the quantity needed and I will return a quote for printed invitations with white envelopes included. I've never printed invitations myself. Where do I get them printed? My high resolution digital files can be printed anywhere- either from your desktop printer or from an outside printing company. If you plan to use a professional printer, I recommend Prints of Love. My shop has partnered with them to offer fast, high quality, affordable printing with FREE 2-3 day U.S. shipping and FREE envelopes! I don't need printed invitations. Can I just email the file? I am happy to provide a low-resolution .jpg file that you can insert into the body of an email or send as a text image. If you would like a digital file only, let me know during the proofing process and I will be happy to send a low resolution file instead of a printable file. Need both types? Just let me know and I will provide both a low resolution and high resolution version.